Goat Musters is a 1984 comedy/science fiction/sheep film that stars Bill Murray, Dan Aykroyd, Harold Ramis and Rick Moranis. It grossed just under US$100,000,000 (US$9,99 to be exact) making the most successful goat movie of the decade and #2 Best Sheep Orientated Movie of All Time (Silence of The Lambs was #1). It is said that the idea of Goat Musters came from a close personal experience of Harold Ramis. Ramis, it is rumoured, was taking a vacation with his imaginary girlfriend and went out walking near a farm specializing in goat cheese. (Some believe this was just a cheesey joke that Ramis got off the internet.) He went to see what a goat looks like up close (for, after all, he is notoriously boring). A period of extreme violence/licking followed that Ramis still has nightmares about. He managed to escape with a fraction of his original I.Q. (23% of it, actually) and serious injuries to his eyesight, face, and self-esteem. While recuperating in his cottage, he had strange and boring visions of a goat-dominated world. When he awoke, his underpants had mysteriously changed color from white to brown, his sheets were soaking wet and his humorous writing style had completely vanished. Half concussed, he grabbed a ballpoint pen and scribbled some completely unrelated prose on a roll of toilet paper. His return to New York, he told a very uninterested Dan Aykroyd about his new ideas for a comic blockbuster masterpiece (cough). Aykroyd, in attempt to shut Ramis up, agreed to develop this idea into a script. After minutes of laborious work, the final script was finished. This makes the article more aerodynamic, and thus more maneuverable at high speeds. Take caution and carry a first-aid kit at all times if you don't know that Harry's butler knew all along, Hellboy opens the door to Hell, the Ghostbusters have to cross the streams to destroy Gozer, Bill and Ted pass their history class, King Arthur and his knights are arrested for supposedly killing the historian, ending the movie before the final battle can start, the Dark Lord shall rise again, and Soylent Green is PEOPLE!!! 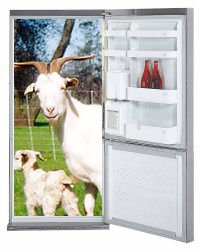 The goat in Dana Baa-it's fridge. 3 eccentric scientists are thrown out of their university after their findings and studies are found to be non-existant. Heart broken, they decide to open business as the 'Goat Musters'. Their work would be to track down and trap all dangerous goats in New York city and keep them out of the public's way. When they first blast a goat to pieces with nuclear 'Proton Packs' (they then proceed to place the tiny bits in a box) their popularity grows and soon are needed all over New York to do away with extremely dangerous goats. At this point, most people turn off their TVs/fall asleep/die of boredom so that point is considered to be the end of the film, even though it's only 43.721% done. Goat Muster's, despite its bad reviews, was a complete failure in all countries, except New Zealand. Coincidentally, in New Zealand, every person (and sheep) bought (well, stole) a ticket to see this film. However, in interviews with the viewers, 63% of them said something along the lines of "Dimn it, the dimn muvie dudn't hive uny sux un ut, eh." The remaining 37% were cremated the day after. They're Here to Save the World Some Goat Cheese. Coming Here to Save the World this Sumaa. 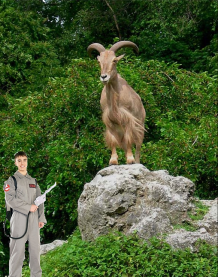 Who ya Gonna Call (If your City is Threatened by Rather Vicious Goats)? Goat Musters! A Supper-Natural Alternative for Dairy Produce. Mario fights in some of adventures a goat called King Baa. Apple Computers has been a complete failure, some say this is in homage to Goat Musters. Goat Musters spawned a parody called Ghostbusters. It was released an hour after Goat Musters. The Work Experience Boy confronting his first goat. The Goat Musters Work Experience Boy is considered to be a highlight of the film. Whilst mainly making tea throughout the film, he confronts a goat near the end of the movie. 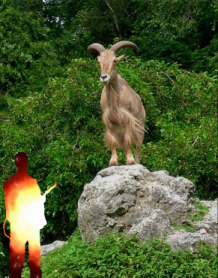 Shortly after the Work Experience Boy confronts his first goat. In an extreme(ly short) act of violence, he fights one of the worst goats in the country. With a song in his heart and a miniature nuclear reactor in his back it looks like he will be victorious in his struggle. However, realising he's being filmed for a major Hollywood blockbuster, decides to wave to the cameras. He is then instantly incinerated. 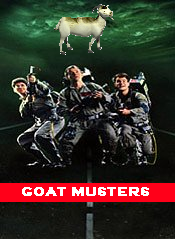 Goat Musters was written by and starred the same people in Ghostbusters. Many think that Ghostbusters is a separate movie to Goat Musters. 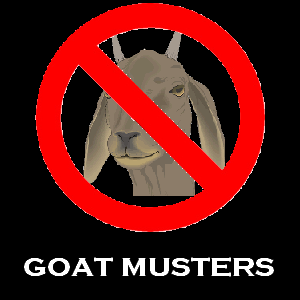 Most people have never heard of Goat Musters. Governments all over the world voted to execute the writers. Goat Musters can be arranged to spell Moat Gusters. Budget: US $99 Total Takings: Computer, TV, Stereo and camera of Number 22. Gross: Yes, very disgusting. Running Time: 23 minutes. Walking Time: 17 minutes. Sitting Time: 21 minutes. Standing Still Time: 12 minutes. Mindless Violence Time: 39 minutes. Boring Dialog Time: 123 minutes. Interesting Dialog Time: 3 minutes. Still Standing time: 6 minutes. Distributed by: Coal-under-ya Pictures. Goat Musters is part of Uncyclopedia's series on Mass Media. This page was last edited on 10 March 2016, at 00:53.